Fashion Week is officially over but bear with me as I post all about the amazing shows I had the blessing to attend. The last show I had the pleasure to be invited to was the one and only TOMMY HILFIGER. Yes ladies, I too jumped of joy when I received the invitation. Tommy Hilfiger is such a classic brand. It is one of those designers that gets immediate recognition and I love his all American style collection. The beach-style show took place at Pier 94 in Manhattan this past Monday. I of course wore my cutest TH dress (which I will be posting about next week) and was ready to enjoy this amazing show. The runway was staged as the fabulous Malibu beach coast, sand and all! Very California, which I dream of. Tommy Hilfiger's inspiration for this Spring 2014 collection was "westcoasting" - of course that would mean the laid back cool attitude and youthful vibrancy of the West Coast lifestyle. The collection goes from Melrose to Malibu. Lots of classic colors, such as summer's staple white and of course two main colors Tommy is known by navy blue and red. I had a few favorites but I am a sucker for a detailed spring sweater with shorts... that look is just so chic and casual. Perfect for spring days and summer nights. I really loved how he mixed a little bit of mod and surfer looks together and created what I think are casual cool looks. For example the outfit below features a short sleeve scuba kit top and navy skirt, the look is complete by a pair of fabulous aqua/blue heels. A little 70's vibe with a super cool classic feel that only Tommy can deliver. I love this look! Spring days and summer nights call for shorts and a cropped sweatshirt with these adorable shorts. My favorite piece was this knit tunic and the one in the first photo. In love with them I can totally see my self wearing it for Spring and Fall! Such a versatile piece. I love the white/cream one most. Well as I took my assigned seat as soon as I walked in the room... ladies, waddayouknow.... 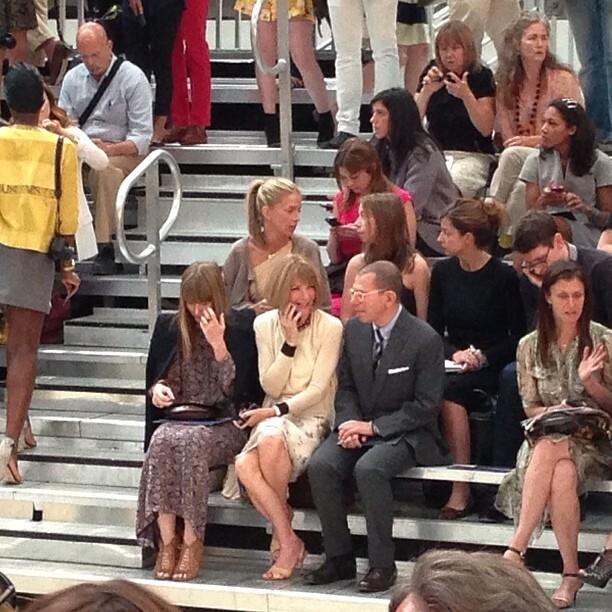 THE Anna Wintour, yes Vogue's editor! was sitting right across from me. Well right across from me and the runway. It was such a fab moment for me! Ms. Wintour and I in the same room? Here is the IG photo I posted immediately after I recognized her. I got her smiling and without sunglasses... thought I also have a classic "Anna" look... glasses and all! She is so fabulous. Also in the room was Leandra from Man Repeller, I walked right by her, she is oh-so-cool, cooler in person. And one of my fave moments, the moment I recognized Thalia, yes Mexican soap opera actress Thalia! She was sitting front row (of course) with her husband Tommy Mottola. She looked stunning in a mustard yellow pencil dress. She was radiant and look so happy! Here is a little photo I snapped as the show ended and I was standin right in front of her. Oooo the Marimar days are long gone for this Costenita ;) those who are Hispanic and watched her novelas know exactly what I am talking about... she looked so sweet. Too bad I wasn't able to take a photo with her because she quickly left after this interview. Ok chicas, I hope you enjoyed my recap of the fabulous Tommy Hilfiger Spring 2014 show. What is your favorite piece? Be ready for lots of outfit photos next week and of course now that Fashion Week is over... back to our regularly scheduled programming!